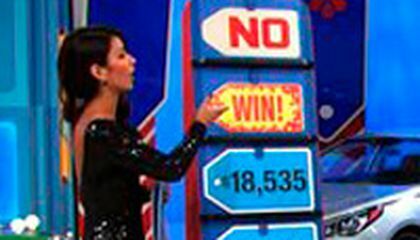 "The Price is Right" model Manuela Arbelaez thought she would have to come on down to the unemployment line. She mistakenly revealed the price of a new car on the TV game show. The 26-year-old model said in an interview that she lost her train of thought while exposing the answers to "Five Price Tags." It is a game that involves correctly choosing a vehicle's value among five oversized tags. Instead, Arbelaez unmasked the correct $21,960 price after the contestant's first pick, even though the participant still had two more chances to guess. "I just zoned out," Arbelaez said. "I literally did not see that coming. My body took over and reacted before my brain had a chance to stop it." The goof brought Arbelaez to tears. It also sent "Price is Right" host Drew Carey into a giggle fit. "Congratulations, Manuela just gave you a car," Carey told the contestant. The clip of Arbelaez's unexpected exposure made the social media rounds online after the episode aired recently. Arbelaez joked about her flub on Twitter. But she said that it wasn't a laughing matter for her during production of that episode. "We took a commercial break and I was still very overwhelmed," said Arbelaez. "I was in tears. I thought, 'Well, this is it.' I asked the producers, 'Am I going to be fired?' They started laughing and told me of course I wouldn't be fired." Arbelaez has been showcasing prizes on "The Price is Right" for six years. She was surprised by the attention her blunder has garnered. The clip on the show's official YouTube channel has received more than 3 million views. "It's been overwhelming, in a good way," Arbelaez said. "I knew I was going to get a couple of tweets and videos with my name tagged on it, but this has gone viral. It's amazing how people reacted. It's been very positive. Everyone has been so nice and supportive." Arbelaez said she wasn't reprimanded for the error and $21,960 wasn't deducted from her paycheck. She noted that there have been many model mishaps over the show's 43 seasons. "There was an occasion when a girl crashed a car into Door 3 and another gave away a trip to Disneyland," Arbelaez recalled. "There have been small things like that over the years, but I think my mistake was the most expensive in the history of the show." Arbelaez hasn't played "Five Price Tags" since her gaffe. She said the next time she's manning those giant price tags, she'll reveal the answers extremely slowly and double-check each guess with Carey. "I guess at some point in our 'Price is Right' careers, we're all going to make mistakes and it was my time that day," Arbelaez reflected. "I probably would've died if that happened within the first year of me working on the show. In a weird way, I'm kind of glad it happened now." Critical thinking challenge: Why wasn't Manuela fired? That Sad...to get your hopes up that you might when a car but then end up not. I would try one of thoose one day. but probaly whell of fourtune. This is hilarious.. I know not for the model but I think that if it was a mistake then she would of said sorry. After even saying sorry I would unemploy her because now the contestant wins a new car by default. Now all the money and car is gone because she ruined it. Plus she is a really pretty model. So good luck..
Manuela wasnt fired because everyone makes mistakes its apart of human nature.If they did fire her for making that mistake im sure it would have been a lot of backlash towards the show and caused them to lose more money. Manuela wasn't fired because it was an honest mistake and it could have happened to anyone. Plus, she's been working there for about 6 years and also, her mistake wasn't the first to ever happen. The Price is Right has over 43 seasons, I mean a mistake is bound to happen. Nobody is perfect. Ablaze is a model on the price is right.. but she hasn't played Five Price Tags since her gaffe. but she posted that there has been many other mistakes on the show,like this one girl ran into the car door. and three other girl 's gave a trip to Disneyland. A price is right model made a mistake on the show. She accidentally flipped over the right price, and the contestant was given the car. She was very embarresed by her mistake and asked if she would be fired. The producers were laughing. They didn't care that much, they knew mistakes are always made. I think that it is very funny that the model did that. It is also good that no one was mad at her mistake. I think she wasn't fired because she hasn't played Five Price Tags since her gaffe.Also she worked there longer than 1 year and it was a funny mistake. I think Manuela wasn't fired because she made an honest mistake and owned up to it. If she hadn't taken responsibility for her actions, the consequences could have been worse. This isn't the first time this has happened on the show, though her mistake was the most expensive out of all of them. Everyone had a good laugh and now she won't make the same mistake again.